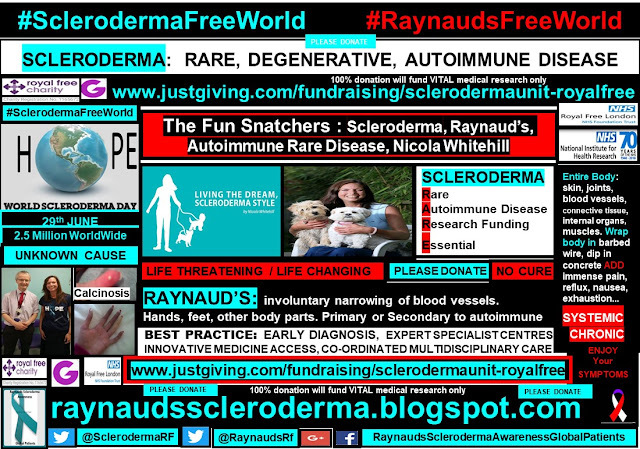 Raynauds Scleroderma Global Patients: The Fun Snatchers - Scleroderma, Raynaud's, Autoimmune Rare Disease. The Fun Snatchers - Scleroderma, Raynaud's, Autoimmune Rare Disease. 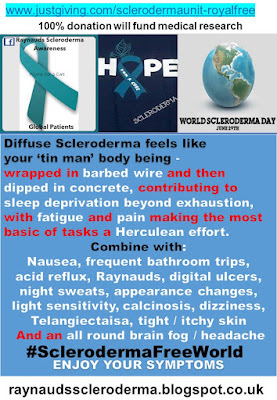 Those three words, ‘You have scleroderma’….followed by, ‘and Raynaud’s’ have without doubt, life changing consequences, if not, life threatening consequences. In this article, I discuss the day to day impact which these three words have, in relation to the lifestyle adjustments and changes required, to respect the full impact of the symptoms. Paradoxically, hearing those words, actually come as a relief, to most scleroderma and Raynaud’s patients, as evidenced by my ‘patient profile combined with research campaign’, for June scleroderma awareness month 2017. I have written about my initial diagnosis and the importance of an early diagnosis, previously. As well as, my personal rationale for making the ‘patient profile combined with research campaign’, for June scleroderma awareness month 2017. Week 3. I am truly convinced that my personal 20 year experience of living with scleroderma and Raynaud’s, is contributed to me being diagnosed within a few months of my initial presenting symptoms, followed by a second opinion at the Scleroderma Unit expert centre, The Royal Free Hospital, 15 months later. Whereupon, I was subjected to a rigorous 18month chemotherapy regime which eventually stabalised my symptoms. With my ‘Skin now being cured from scleroderma’, 19 years later. After having been told ‘You have scleroderma’, I was then told that I was probably looking at a maximum of 15months, due to the aggressiveness with which the disease was attacking my body. At the time, 1997, I was working in the pharmaceutical industry as a medical representative, as well as, studying towards my barrister qualifications on a distance learning basis. I was advised to give up my dream of being a barrister and to accept my medical fate. On 1st March 2004 I qualified as a self employed barrister, and stopped the daily 2g mycophenolate mofetil regime of the previous 6 years. I am now 13 years immunosuppressant / chemotherapy free. The only medication which I take is bosentan 125mg twice a day, along with Co-Proxamol analgesics for emergencies. Sadly, the physical requirements of the barrister role were too demanding on my scleroderma and Raynaud’s damaged body. Although my level of disease is stable, my day to day reality is dictated by my symptom demands caused by the damage from the scleroderma, when it was active. Namely, musculoskeletal pain, GERD involvement, calcinosis and I have extremely sensitive Raynaud’s. This combination of symptoms makes for easier management, by me staying at home as much as possible. In an attempt, to minimise severity, as well as, an attempt to prevent Raynaud’s attacks. I also have a strict diet. Prior to my body developing scleroderma and Raynaud’s, I was a very outgoing social individual. Now, my social life, as well as my working / career life has been superseded by medical appointments taking priority in my diary and depleting my limited energy stores. I am a huge fan of Andy Murray, the UK tennis player, who sadly was not able to defend his Wimbledon title fully this year, due to a hip injury. I am sure, every scleroderma and Raynaud’s patient can relate to a similar intense disappointment and sadness at not being able to fulfil a desire, due to their body not being up to it. In particular, I am no longer able to play tennis, a sport which I very much enjoyed. Infact, all exercise is extremely challenging for my ‘tin man’ body. I have the utmost respect for my fellow patients who are still able to exercise. I have learnt, over the last few decades, to not focus on what I can no longer do, and focus on what I can do, and, on what makes me feel good. I have shared more of my coping strategies on my www.cosmicfairy444.blogspot.co.uk. So, although this party girl is no longer able to be so foot loose and fancy free, the party has been relocated to my lounge, with the best DJ, and no queue for the conveniences.